So we've finally made it to June, the start of summer. Although the English weather may be playing catch-up, I'm in summer mode as of now; at least in the kitchen. It's time to ring the changes to food we eat and celebrate the bounty of fruit and veg the new season has to offer. For me, summer cooking needs to be quick and simple. Lazy lunches and easy-to-throw-together suppers that can be eaten outside if the mood takes you. Think lots of inventive salads, light pasta dishes, savoury tarts, grilled fish and all manner of seasonal vegetables and puddings that make the most of the berries and stoned fruit. That's where I'm at. The other great thing about summer food is eating outdoors. Whether it's an alfresco supper at the end of the day, a ploughman's in the pub garden, a picnic on the beach or just a cup of tea and a slice of cake in the garden - it always tastes better when there is a bit of sun on your back. 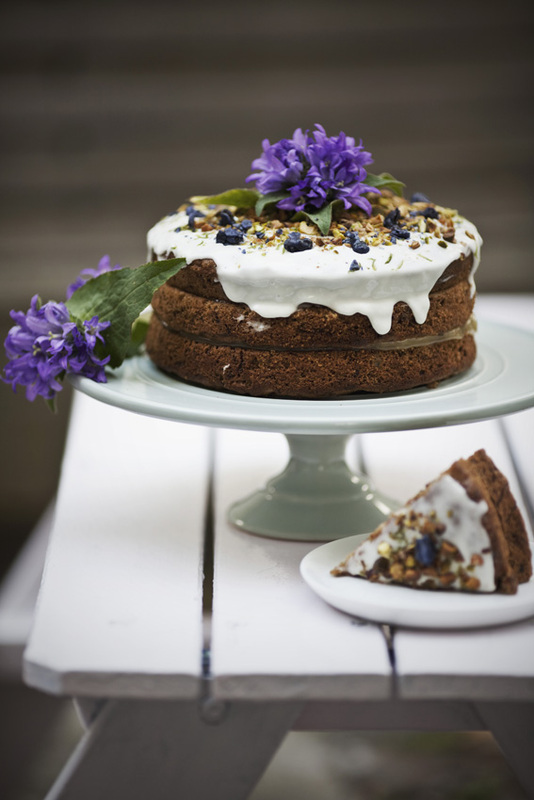 So today, I thought I'd share one of my favourite summer cake recipes: Courgette & Walnut Cake. It tastes of summer and is as pretty as a picture and perfect when served with a cup of tea on the lawn. But first, a note. The recipe here is for a simple two-layer cake. You may notice that the cake I made in the photograph here has three layers. I have a fondness toward the three-layered version which is purely for aesthetic reasons. If you want to follow suit, I simply made the cake twice over and incorporated the third layer. The forth layer was simply eaten whilst still warm from the oven: a baker's perk if you like. Preheat you oven to 180C/ gas mark 4 and grease and line 2 x 21cm sandwich tins. Wipe your courgettes with a piece of kitchen towel and then peel on the coarse side of a grater, peel and all. Once you have your pile of grated courgette, take a handful at a time and squeeze over the sink to remove excess water, placing the drained courgette in a bowl ready for adding to the mixture in step 4. Put the eggs, oil, sugar and vanilla into a large mixing bowl and beat until creamy. Next sieve in the flour, bicarb, baking powder and spices and continue to beat until well combined. Now add your grated courgette and walnut pieces and stir briefly until the mixture is flecked emerald green and studded with walnuts. Divide the mixture equally between the two tins and bake in the oven for approx 30mins. The sponges are ready when slightly browned and firm to the touch. Once cooked place the tins onto a rack to cool for 10mins before turning out to cool completely. Once the sponges are completely cool, you are ready to fill and ice. For the filling simply spread generously with some lemon curd. To make the frosting beat the cream cheese together with the sieved icing sugar. Add a little more icing sugar if you feel your frosting is a little too runny. I tend to find the consistency differs every time I make my icing, so feel free to tamper with it until you are happy. When your cream cheese and icing sugar are combined add a squeeze of lime for a delicious zing. Again, go steady in order to keep your frosting at your desired consistency. Smear the top of your cake thickly with the frosting. If you want to firm the icing up at all, place the cake in the fridge. Just before serving sprinkle with the chopped pistachios and crystallised violet pieces and finely grate over some lime zest. A coordinating flower placed in the centre as a finishing touch is my little piece of creative freedom, but by no means a necessity.